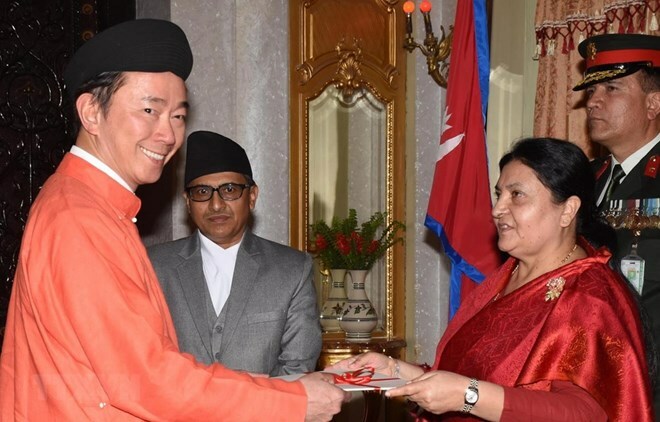 New Delhi (VNA) – Vietnamese Ambassador to India, Nepal and Bhutan Pham Sanh Chau presented a letter of credentials to Nepali President Bidhya Devi Bhandari in Kathmandu on March 18. Chau said he is honoured to assume the position as the Ambassador of Vietnam to Nepal, and committed to doing his utmost to boost the two countries’ relations in a more effective and practical manner. The Vietnamese diplomat then paid a courtesy visit to Prime Minister K.P. Sharma Oli and several high-ranking officials. At the meetings, Nepali leaders showed their impressions at Vietnam’s rapid economic development achievements, as well as their delight at the development of the bilateral relations after 44 years Nepal and Vietnam set up diplomatic ties (May 1975-2019). They affirmed that with similarities in culture and economic development situation, the two sides can promote the ties more effectively in the time to come. They stated they hope to receive Vietnam’s support and learn from its experience in preserving and promoting the values of cultural heritage and in developing the agricultural sector. For his part, Chau affirmed Vietnam’s consistent policy of respecting its relations with traditional friends, including Nepal. He voiced his wish that the two nations, based on their fine political ties, soon sign a memorandum of understanding on the exemption of visa for diplomatic passport holders, and consider establishing a political consultation mechanism and other cooperation mechanisms related to economics, trade, investment, culture, tourism and aviation.